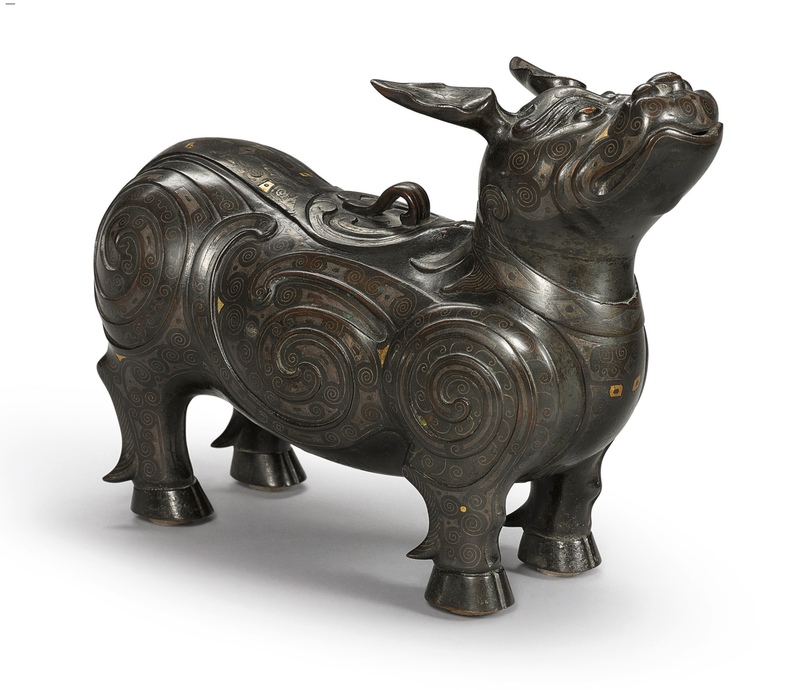 Last spring, March 2017, a gold and silver-inlaid bronze tapir-form vessel dating to the Ming dynasty amazed auction viewers when it sold for $492,500, well above its $20,000/30,000 estimate (Sotheby’s New York, Important Chinese Art, 15 March 2017, lot 565). This fall at Lark Mason Associates a similar gold and silver-inlaid tapir form vessel is being offered on iGavel Auctions. They are each decorated with abstracted swirling designs. This type of decoration in Chinese art is called archaic and it reaches back several thousand years to the Bronze Age. The Chinese have a long history of making bronze vessels and implements. By 1700BC, the Bronze Age in China was underway. These earliest bronzes were made for ritual use to offer wine and grain to ancestors or gods. These archaic bronze vessels were made in a specific set of shapes, each with its own use, and with a specific type of decoration. The decoration was based on a motif called taotie and the taotie design was created on a ground of patterned swirls called leiwen. The taotie is understood to be an abstracted facial or animal motif, and on these bronzes, one can find animal face and body forms, based on both real animals and mythical animals. From the Shang dynasty to the Zhou and then Han, the animal forms became less and less abstract. The original archaic bronze shapes and forms from the Shang dynasty and later continued to be created and used, and have even been carried over through history to the present day. The original use for the shapes and decorative motifs have changed and they have also become divorced from their ritual functions. The two gold and silver inlaid bronze tapirs are derived from ancient forms created during a later time period. The tapir offered on iGavel Auctions has a bold swirling leiwen pattern ground that dominates the entire figure which has no taotie or other archaistic design elements. The animal is both abstract and realistic. This bronze tapir is also a censer with a hinged cover, connecting it for ritual use to its ancient forbears. Bronze vessels are desirable and regularly achieve record prices at auction. This tapir will be sold online at iGavelAuctions,com, October 6th to October 25th, 2017, and can be viewed at the New York office of Lark Mason Associates, 227 East 120th Street.